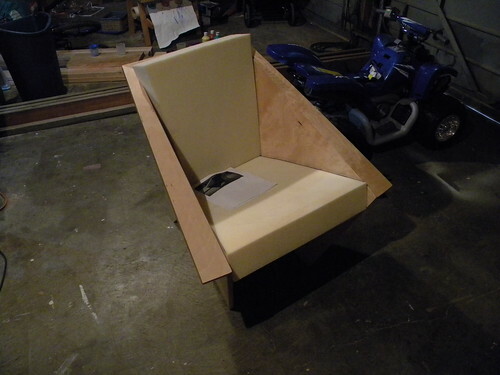 The earliest variations of the plywood easy chairs were to be made out of 1/2" material. My guess is that after numerous complaints from the craftsmen who were responsible for solving this amazing puzzle, Wright relented and made it a tiny bit easier to fabricate by specifying 3/4" ply. The name "origami" came later, and I'm not positive that it was Wright who titled the creation. 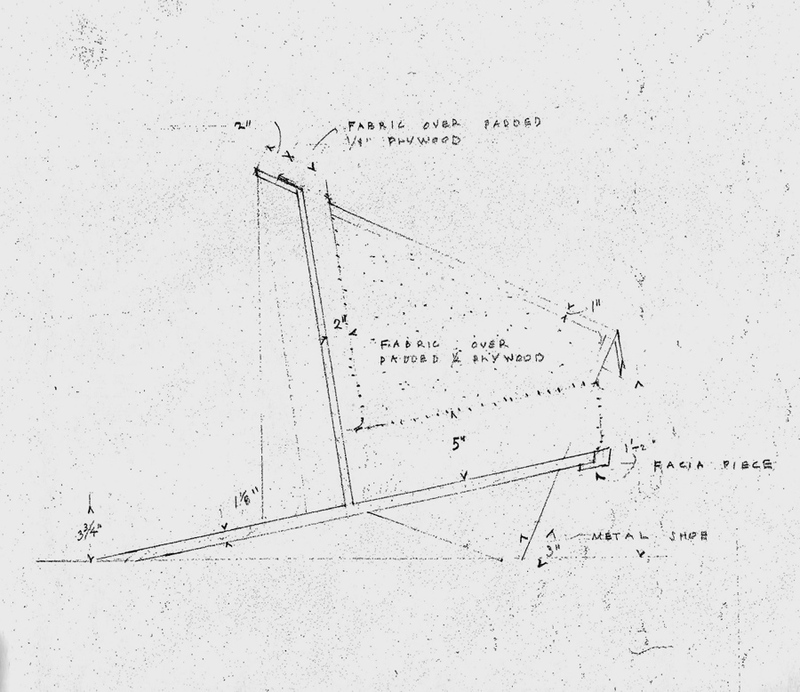 These are the "sled-back design" or three legged chair designed by Wright. As Stafford wrote earlier, the four legged chair is Howe's creation. I don't know of a Wright chair of this basic type with four legs. The redwood veneer was found in California by Peter. 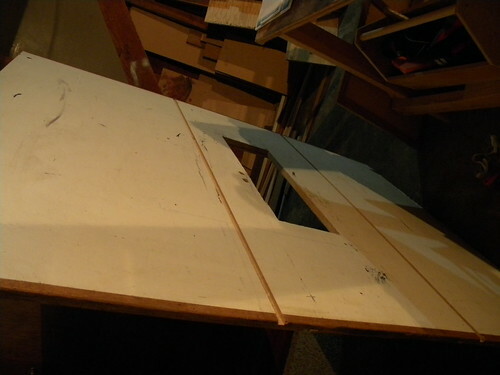 The plywood for Peter's chair is made from a sheet of 1/2" marine grade ply with redwood veneer. 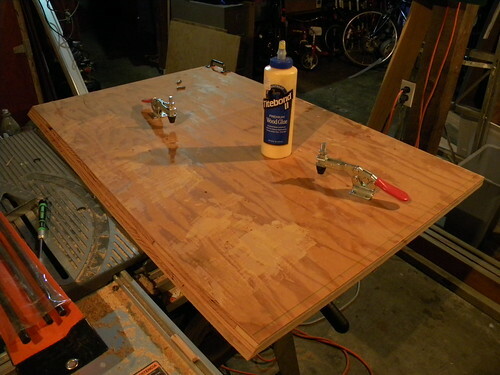 We used marine ply because the ply's are a closer match to the old plywood. Then the veneer is cold pressed to the plywood for about two hours after two hours the plywood is removed from the press and set on edge to dry. The chairs are nice, though not my fav design. But that table in between..that's the ticket. Anyone have measurements for that? Oh, and a really skilled craftsman to make it? 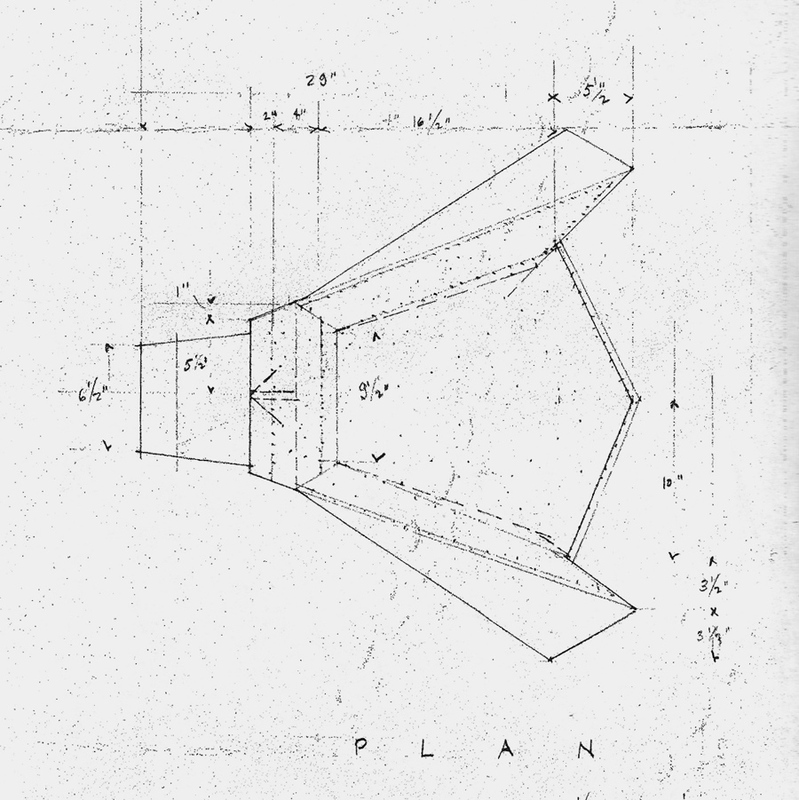 "Origami" was not coined by Wright, it most likely was introduced by a creative writer...does anyone know who first used the term? The drawings for the Dobkins are titled "The Upholstered Plywood Chair" and that was either in 1953 or 54. The Dobkins chairs were specified 1/2 inch for sides and back. 3/4 inch for arms and seats only. 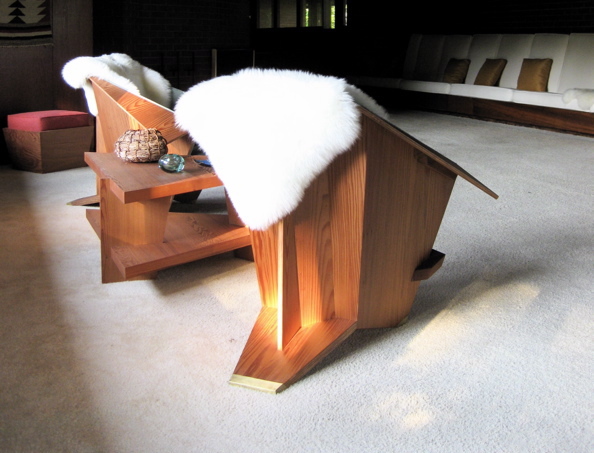 If the Plywood Chair was designed in 1949, what was used in Taliesin W. before 49? 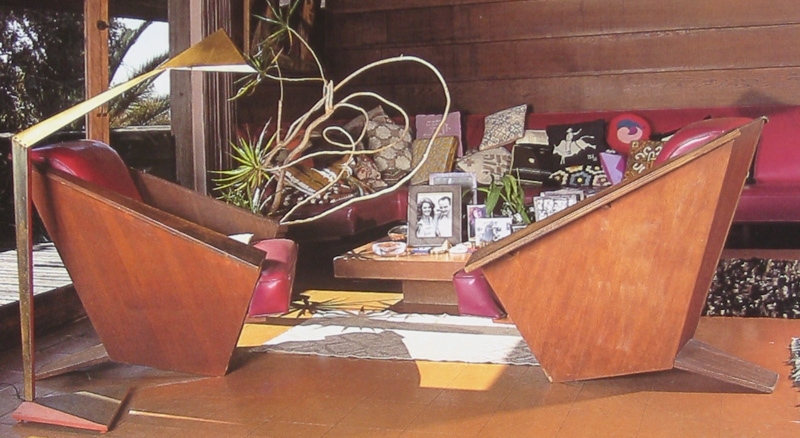 I've only seen pics of the "Plywood Chairs" in the living space. I'm sure someone has pics before the chair was designed. 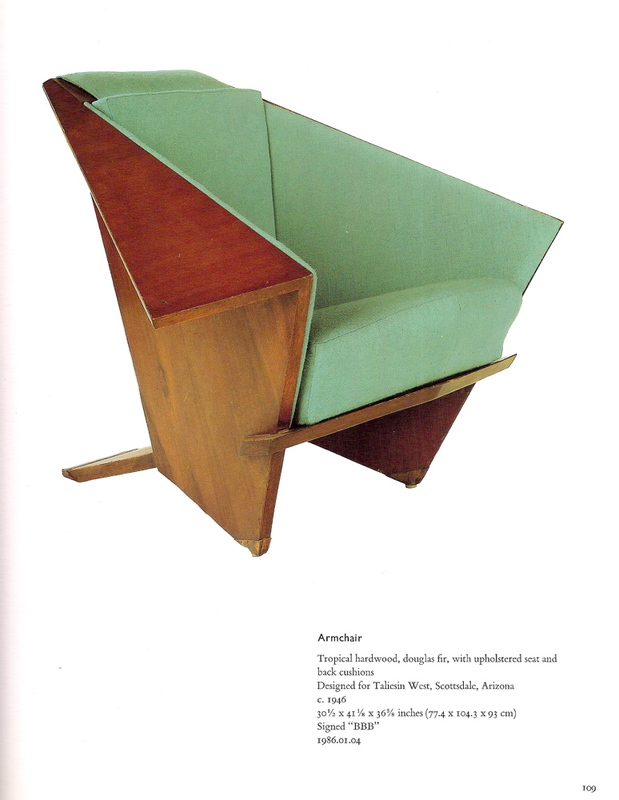 In David A. Hanks' "Domino's Pizza Collection" book (pg 108-109) there is a picture of what is called a "prototype" Origami chair which they state was designed for Taliesin West's Living Room. They mention it having a blueprint date of 1946. Here are the two pages from David A Hanks' Domino's collection book. 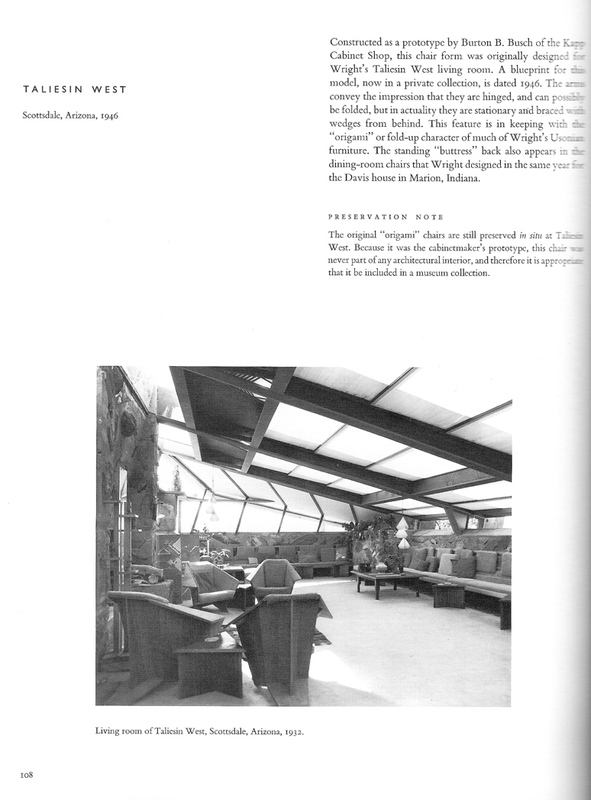 The photo of the Garden Room (living room) is dated 1932, an obvious impossibility. Below are two photos of the room, from 1940 and from sometime after 1946, that differ from the above photo in the matter of the ceiling, at least. These are from Curtis Besinger's memoir. 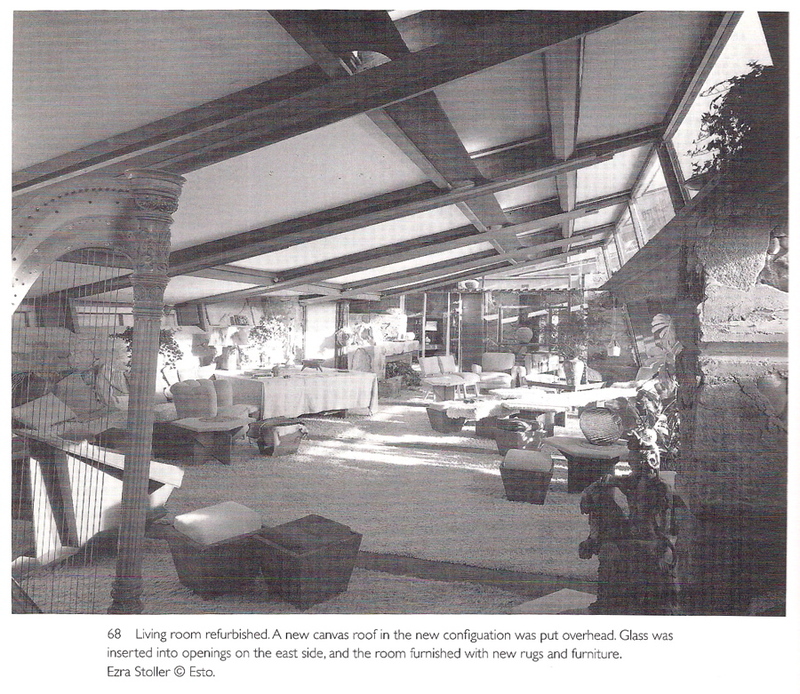 He says, of the 1947-47 refurbishment of the room (which included new canvas roof and glass inserts in the vertical surfaces), "Part of the refurbishing included new rugs and furniture in the living room. When in place, we joked that the living room looked like Korrick's furniture department. It was full of blond wood furniture, with woven-webbing seats and backs, and pastel-colored cushions." 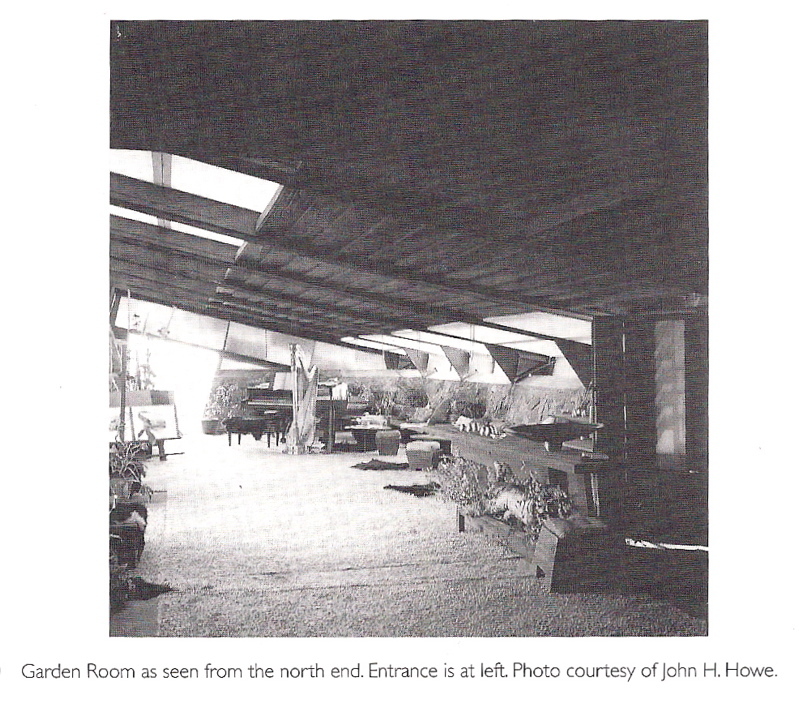 He shows the Stoller photo (below) in this part of the book, but no date for this image is given. Posted: Mon Jun 20, 2011 12:27 am Post subject: Chair project. I can put the jig on either side of the blade and don't have to worry about it falling off one side or the other before or after the cut. The wood is finished and actually looks pretty nice - it's birch plywood. The cushions are waiting for me to pick out a fabric and take it to the upholstery guy for a foam trim and some sewing. I had real problems with the arms, as a bunch of screwy angles come together in the back corners. In this case I wanted to miter all the corners. I never did get it to a place I was happy with it, but I got it to where it looks good from the top. Don't look underneath the arms! I intend to build one more. This one will have birch PW, but solid maple arms that I will cut a dato in and insert the sides into the bottoms of the arms. There may be an overlap of some sort, but the miters were just too much work, I couldn't get them to fit well and I think the dato will be stronger anyway. A couple of other interesting things. The arms took two people to get in place - there may be people that know good ways to work that out, but I never did come up with a way to hold everything together with clamps. This chair is super comfortable. Everyone that sits in it says so. That's the reason I wanted to build one. I'll post a picture when I get the cushions done. Thanks, Denny. Good moves. I think the thing that's becoming evident is that this is an "every-man-for-himself" design (not leaving out the ladies, of course). That is, you just have to figure it out for yourself, and build it the way that seems right to you. That said, yours has the lowest arms, at the steepest angle, and with the narrowest top surfaces that we've seen yet -- from what I see in your photo. I'm not prepared to say that's a mistake; if the chair is comfortable, then you've done better than some, I imagine. This thing is like a cake with no recipe, or a song that is learned by ear. It's a mystery that everyone has equal access to -- once they take on the challenge. The steps in the process you followed are the minimum that I think I can imagine, if I were to try one. And no, I don't love this chair enough to want to start in on it. I just hail anyone who has the hankering. 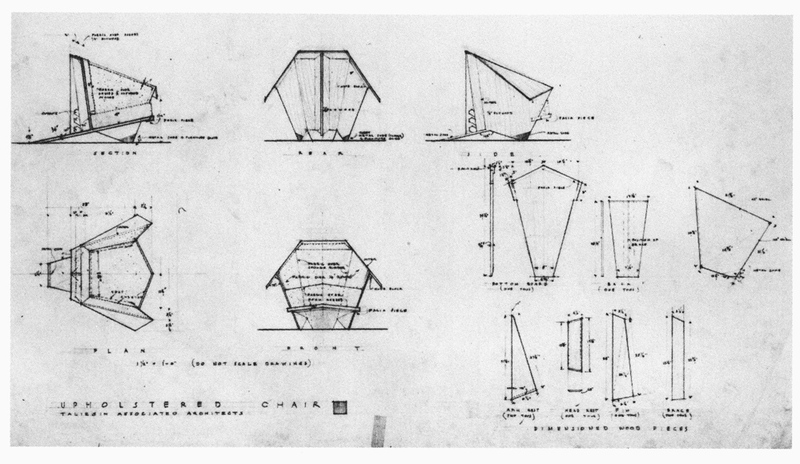 Some day, someone may go all the way, and present us with a total construction document, with every thickness, angle, and dimension noted -- for one version of the chair. Until then . . . good luck, everyone ! Be sure to keep us up to date, Denny. And don't wait for the final one to take more pictures. After all, a tornado could descend tomorrow (heaven forbid) and take it all away. Interesting comments about the arms. I hadn't looked back at the other pics for a while, but since you pointed it out I see what you mean. The width of the arms actually work OK, but the steep angle and the termination point so close to the cushion are an issue I will seek to remedy in my next chair. Part of it might have to do with how far past the end of the seat portion my arms extend and the fact that the cushion itself isn't trimmed to size yet. I basically used a 90 at the floor and the arms and tipped the piece at an angle. Your point means I'll need to adjust that angle at the arms or provide a higher back. I'll sort that out later. You could compare your side view to these examples. Yours seems closer to the Sturges version ? It also has narrower and square-end arms, like yours. SDR, I am curious about the measurements in the lower left corner of your scanned Drawing. Is there any way you can scan or crop a detail of that to make it readable? I have two drawings, both are from Howe's collection and contained some cut lists, but neither had what appear to be the detail included in yours.